Village hunting zones in southeast Cameroon are helping to stop poaching of animals for the bushmeat trade while still providing money and employment for local people. On the edge of the rainforest in southeast Cameroon, Baka pygmies from the village of Lantjoue are having a party. Everyone is dressed in their finery and the drums are beating. A feast of yams, plantains, freshly caught fish, and a big pot of antelope stew is spread out in the village school room. The reason for the party? The arrival of new desks and equipment for the school, paid for by a community hunting project that the villagers set up with help from global conservation organization WWF. Lantjoue is typical of the small communities on the fringes of Cameroon’s rainforest. The Baka and Bantu people have lived here for generations, eking out a living by growing crops, working in the logging concessions, and hunting and gathering in the forest. The truck drivers sell the meat in the markets of Yaoundé and Douala, where it commands a high price. The trade is so lucrative that it has attracted people from other parts of the country, who now poach animals in the forests. The new approach is to help local people manage hunting for themselves. Instead of government-imposed rules and penalties aimed to discourage hunting for the bushmeat trade, the villagers of Lantjoue can instead regulate their own hunting quotas in a defined village hunting zone. One incentive to keep wildlife abundant is foreign trophy hunters. Among many other species, the forest around Lantjoue is home to the elusive bongo antelope (Tragelaphus euryceros). This magnificent tan-and-white-striped animal with slender spiralling horns only lives in a few places in Africa. Trophy hunters are prepared to pay large sums of money for one. These rich foreigners want to be sure that they will find a bongo during a fairly brief visit. If the villagers can guarantee this, then the trophy hunters will come to their forests. Under the project set up by WWF, the villagers must limit their own hunting and ensure that lots of bongos can be found in their forest. The trophy hunters pay a large license fee, part of which is returned to the villagers to pay for improvements such as the equipment for the school. Diopim Akanda, the village chief, is happy. 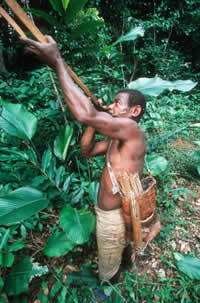 A small group of Baka pygmies have set up a camp next to the village, and act as guides for the trophy hunters. "The pygmies have an astonishing knowledge of wildlife,” says Usongo. “It’s fascinating to spend a day in the forest with them. You see things that you would never see on your own, and they understand the habits of the animals amazingly well. There are gorillas, chimpanzees, and a wealth of other species to be seen. We hope that in the future, ordinary tourists will come to shoot with their cameras rather than with guns". Adjacent to the village hunting zone is a large logging concession run by a Belgian family. Manager Jules Decolvenaere has also joined forces with WWF. "We are keen to get our timber certified under the Forest Stewardship Council (FSC)," he says. "We think that we already meet most of their standards for environmentally and socially responsible forest management. We also try to protect wildlife but it is very difficult, and conservation groups will criticize us if poachers come into our concessions." Decolvenaere welcomes the new village hunting zone and supports the WWF initiative. It’s also a matter of professional pride for Decolvenaere. “My family has been working these forests for over 30 years,” he says. “ We are keen to demonstrate that our industry can be good for the forest and good for the local people." To help the efforts to restrict hunting, the logging trucks returning from the cities now bring frozen meat back to the concessions. Decolvenaere wants to be sure his workers have access to meat without resorting to poaching. "We pay our staff well and we want them to share our goal of being a responsible environmental company — so we practice good logging and we try to protect the wildlife". Leonard Usongo is enthusiastic about the new developments. "We used to put all our efforts into national parks but it was difficult to get much local support,” he says. “This area is too remote for most tourists so the parks don’t do much for the local economy. Now we are trying to conserve the broader landscape. Jill Bowling, who manages WWF's global Forest Programme, believes the work in southeast Cameroon has potential in other parts of the world. WWF’s approach now emphasises a balance between protecting, managing, and restoring forests — which makes a lot more sense to local partners in poor countries than just protection alone. The forests of southeast Cameroon are part of the Western Congo Basin Moist Forest Ecoregion of Central Africa. This is the one of the richest ecoregions in Africa in terms of biodiversity, supporting many species of mammals, including western lowland gorilla and forest elephant, as well as birds, amphibians, fish, and swallowtail butterflies. However, the area faces increasingly severe threats from commercial logging and mining, as well as large-scale commercial hunting for wild meat (bushmeat) and ivory, which often uses logging concession access roads. The forests are one of WWF's Global 200 ecoregions — a science-based global ranking of the world's most biologically outstanding habitats and the regions on which WWF concentrates its efforts. 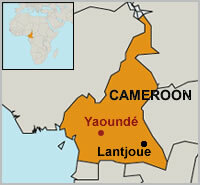 WWF Cameroon has been active in the southeast corner of Cameroon since the early 1990s. The office’s Jengi Forest Programme — which covers an area of about 2.7 million hectares, around 12.5 % of Cameroon’s total land area — aims to ensure the sustainable management of area's biodiversity and contribute to improving the living conditions of local people. Community hunting is one Jengi Programme project. So far, 14 hunting zones have been established in forest areas surrounding three protected areas in southeast Cameroon: Lobeke, Boumba Bek, and Nki National Parks. Twenty villages currently benefit from this initiative, which generates some US$100,000 per year to local economies. WWF is also providing technical assistance to elected village wildlife management committees to build their managerial capacities. There is a very strong bond between local communities and the WWF project, as demonstrated by the people of Lantjoue. • duiker populations — a highly hunted antelope species — increased from 8.1 individuals/km2 recorded in 1996 to 11.4/km2 recorded in 2002. Other Jengi Programme projects include establishment of protected areas, ecological monitoring, and sustainable forestry management. For generations, the Baka have hunted and gathered in the forest. Poaching of animals for bushmeat is a growing problem throughout central Africa. Here, monkeys are displayed by the roadside in Gabon for sale to passing motorists.